A pleasure to be involved in the SALC (School of Arts, Languages & Cultures) Christmas party. Held at Christie’s Bistro, originally Manchester University’s principal science library, it’s quite unique setting within this iconic building makes a great backdrop for private parties & events. 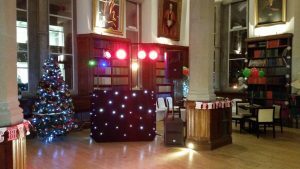 They had booked our popular party DJ Andy B to play from 5pm till 1am. The early evening was more of a drinks reception followed by a buffet, then they were ready to party! 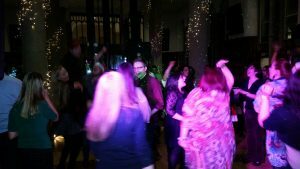 A short clip of guests letting their hair down to ‘Teenage Dirtbag’…! Top night had by all!